Techniques developed with careers in mechanical engineering and technical illustration contribute to the execution of fine art watercolor and oil paintings. A native of Jersey City, New Jersey, Ted was educated in schools within the state including Newark College of Engineering. He demonstrated artistic ability early in life. “My grandmother cleaned offices in a building in Manhattan and would bring home scraps of paper and bits of pencils that she knew I would make good use of.” But another interest in the operating mechanics of things led to a profession in the field of engineering. 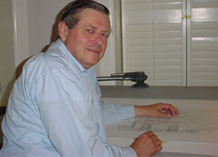 After a hitch in the U.S. Navy, Ted began formal schooling in mechanical drafting and machine design which enabled the skills requiring exactness for the development of two-dimensional engineering drawings. Technical illustrating brought that exactness to the third dimension. While all this experience was acquired in a vocation of applied art, an avocation in fine art was emerging. Having no formal art training, the basic fundamentals instituted with a formal art education, composition, balance, color, value and contrast were self-taught. Although Ted does not do the art show circuit anymore, there was a period when that was the only avenue for public exposure to his work. Reluctant at first to enter because of his limited training, he came away from his first competition in 1971 with a first prize for oil. His paintings have been accepted at numerous juried competitions and is the recipient of awards in six states. His work is part of private, public and corporate collections throughout the world. He and his wife Joanne reside within Savannah’s historic district where he maintains a working studio. Copyright © Drayton Gallery, Inc.